Over the past thirty years, Deepwater, who has offices worldwide, has been delivering world-class solutions to protect offshore infrastructure from corrosion by developing more efficient systems to protect, monitor and extend the productive lives of ageing assets. The solutions include cathodic protection (CP), permanent CP monitoring, CP design and engineering and corrosion inspection and survey. 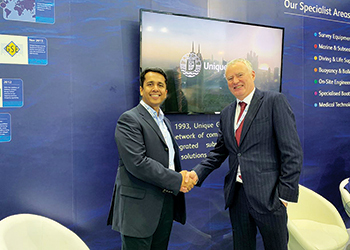 At the onset of this partnership, Sharad Kumar, group director business development, at Unique Group, says: "We’re pleased to have partnered with Deepwater for the Middle East region to offer our customers the best-in-class offshore corrosion protection systems designed and built in America. Our Survey Equipment division has been offering a wide range of products for inspection and corrosion monitoring for several years; with the inclusion of a new lineup of Deepwater products, we’re looking forward to enhance customer experience by helping them extend life of their aging offshore and marine assets." Steve Hankins, technical sales manager at Deepwater, comments: "Deepwater is pleased to have partnered with Unique Group, one of the world’s leading equipment suppliers in the Middle East region. Over the past three decades, our cathodic protection systems have been providing a more efficient and affordable alternative to conventionally available systems in the market across Europe and the Americas. We now look forward to introducing our corrosion protection technologies in the Middle East region with the same level of service and quality as seen in the other parts of the world." Founded in 1993 Unique Group is a market leader in the delivery of engineering expertise, sales and rental equipment and the latest technology for the marine, diving, pipeline and subsea market sectors. Unique Group provides bespoke, off-the-shelf engineering solutions and cost efficiencies across the oil and gas supply chain — onshore and offshore, surface and subsea. Unique Group employs over 500 people worldwide through its seven multi-site divisions: Survey Equipment; Marine and Subsea; Diving and Life Support; Buoyancy and Ballast; On-Site Engineering; Specialised Boats and Medical Technology. Its 200-plus dedicated engineering specialists work across nine strategically important global oil and gas regions — USA, UK, Europe, Singapore, India, South Africa, Kingdom of Saudi Arabia, Qatar and UAE.